I still remember... More than 15 years back, I used to dine in Kenny Rogers Roasters at Marina Square, Singapore when my husband and I first started dating. 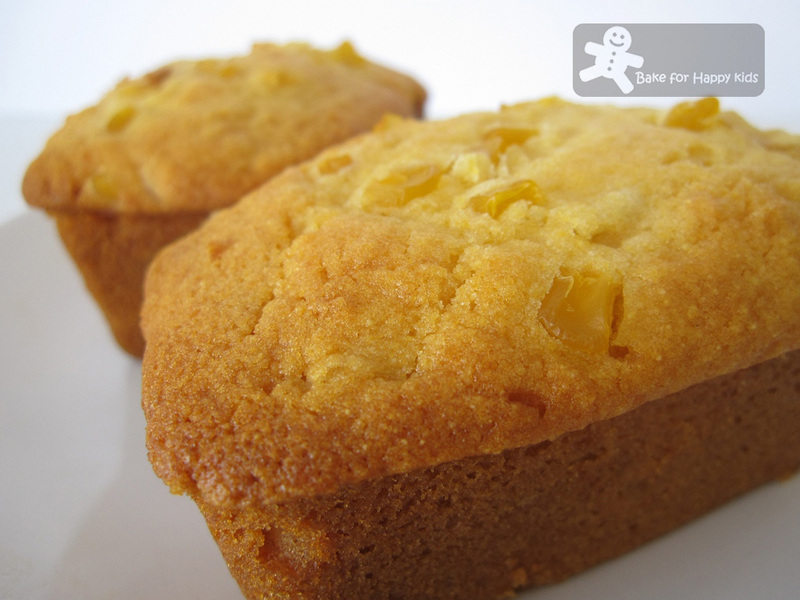 Their corn muffins are always my favourite and I would take-away a couple of them for my next-day breakfast. 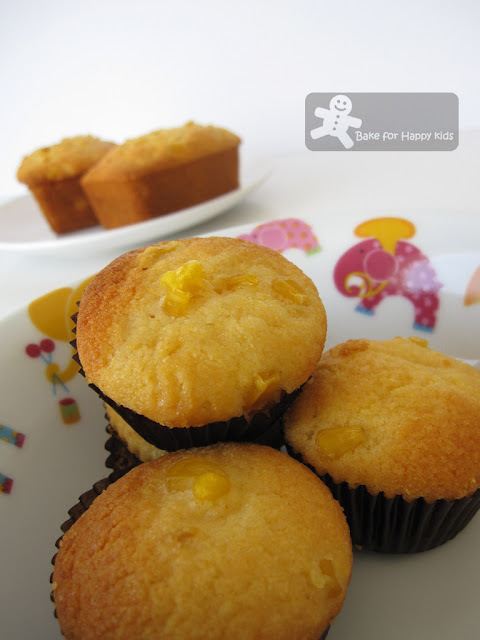 The recent trend of making corn muffins amongst my fellow food bloggers has reminded me my good old days of enjoying these muffins. With the help of Google, the search of "Kenny Rogers corn muffins" has prompted me a great corn muffins recipe from Food.com. After comparing this recipe with others including the one by J3sskitch3n , I think this might be the potential source of most "Kenny Rogers" taste-alike corn muffins recipes. For a healthier option, I've replaced butter with rice bran oil spread and 1 egg with cream corn in this recipe. I was happy that these freshly baked muffins were very delicious and brought back great memories. Here's the original recipe from Food.com and my modified recipe is in blue. I made 4 mini loaves and 16 mini muffins with this recipes. Using an electric mixer, mix butter (or spread), sugar, honey, eggs (and cream corn), and salt into a large bowl. Add flour, cornmeal, and baking powder and mix thoroughly. Add corn to mixture and work into mixture. Do not mash corn, the whole kernel is baked into the muffin. Grease loaf tin or line muffin pan with muffin cups and fill them 2/3 full with batter. Sprinkle an extra 2 tbsp of corn on the muffin batter before baking (optional). Bake for 20-25 minutes until muffins are light brown. The texture is amazing Zoe! moist and soft!! divine! Oh yes...that brings me good old memories too. I love the crunch in Muffins. Will bake some of these to rekindle those memories. Zoe, the muffin texture looks perfect!! Is moist and soft! Have not try on Alfa rice bran before does it make the muffin having any special kind of aroma? Lovely texture, muffins looks super prefect.. I bet your corn muffins taste much better than those from Kenny Rogers. Theirs have shrunk in size but increased in price! Isn't it amazing how we most of the times connect food with memories? These corn muffins look delicious! I've never ate this muffin - although I've seen a recipe for it before - but I really like the look of it. It looks so light and golden. I love Kenny Roger's cornbread too! I have tried the recipe (seems like most google hits for Kenny's corn muffins point to this one) and they turned out well, though they didn't look as good as yours! But I find the taste of honey a little too strong for my liking. I guess it's either due to the brand of my honey, or a problem with my tastebud. LOL. I made this too a couple of months back and I reduce the sugar and honey! I couldn't tell whether how close they are to the original as these corn muffins are not served at the KR's outlets over here! Have not tried the original before. Yours look really moist and delicious! Wow, Zoe, these look absolutely amazing. 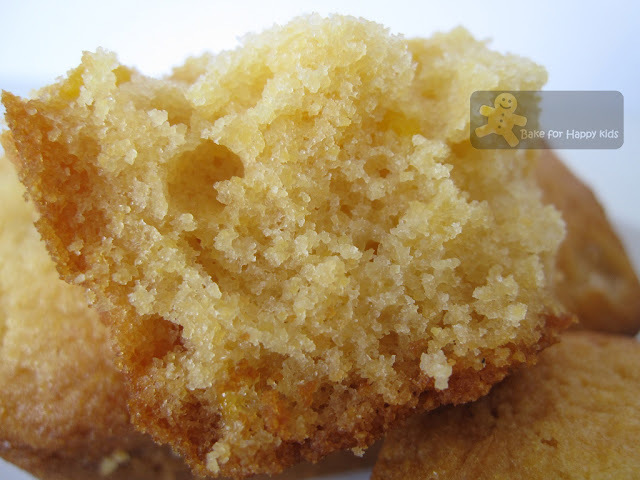 I love that close up shot of the corn muffin, it makes me just want to dive into it and start eating. It's perfect. hi zoe, this looks pretty good. I also seen jess making these corn muffins much earlier and i've bookmarked it, never able to do it yet. would like to try this sooner. Hope you had a great valentine's day and happy chap goh mei! That looks perfectly moist and scrumptious! Those muffins look great! I'm sure they're way better than the Kenny Rogers version! I remember those muffins too. It looks like you got them perfect. Mmmm these look good. I have never tried baking with rice bran before. I wonder if my grocery store sells it. Really love your modifications - really clever stuff! Mmmmm, these look so good! Cornbread/muffins are always a little nerve-wracking for me. They either turn out really delicious or really dry and disappointing. These are beautiful! I've never actually had corn muffins before, but I do love corn and muffins so these look like something I'd really like! I have to agree with everyone else too- the teture of these muffins looks so good! Zoe, need I say more? I bet Kenny Rogers will regret for this. haha.. Hope you're having a great week ahead, darling.